Anyway, This Means War is a date movie to watch when you don't want to actually WATCH a movie. It is so trite and goofy, only Hollywood could pump this stuff out. It stars Tom Hardy and Chris Pine as two best friends and super agents that can't seem to find the right girl to settle down with. Tuck (Hardy) is a sensitive bloke who was married and has a son but is now divorced and can't seem to make this work with his ex-wife or son. FDR Foster (Pine) is a consummate ladies man who is always on the make and he changes women like we change socks. Reese Witherspoon is Lauren. She is a bossy ad exec who, of course, is married to her work and nothing else. She wants to find the right guy but he will always come second. As for Tuck and FDR Foster, they are married to their work, too but only because they have nothing else. Somehow they both meet Lauren at different times unbeknownst to the other. When the guys realize they are dating the same girl a challenge arises. Which one will she choose? Lauren, of course does not know the two men she is dating know each other and are crime fighting best friends. Foster's off handed comment that Tuck has been out of the dating game for so long that Foster would win her hands down, pisses Tuck off. "Let the best man win." Now they must fight the baddies, and get the girl all at the same time.........*yawn*. I really wanted to like this film. The cast is attractive and there is a certain charm but this wears out quickly as the viewer is treated to stale retread bits from other film. True Lies comes to mind. They use Drones, tranquilizer guns, surveillance equipment and all kinds of shmoozing to try to find out what the other guy is doing. Company resources that most people would be fired for, I might add. But this is a romantic action comedy so that is ok. Right? As long as the plot needs it, they use whatever the hell they want. The problem is we have seen it all before. Then there is the obligatory meeting of the families while Lauren laments who she will choose. 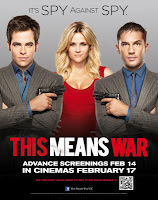 This Means War is a one joke film that has a few chuckles but nothing more. It is the kind of film that thinks it is a lot funnier than it really is. Director McG knows how to stage the action but the script by Timothy Dowling and Simon Kinberg runs out of steam very quickly. The 3 leads don't do much except blather on with tired dialogue and the although the action is competently staged, it is the mystery of the bad guy that is never explored. Lethal Weapon was the kind of movie This Means War was trying to be. Lethal Weapon had a great script, great action and solid acting. The bad guys were real scum-sucking vermin and we could get into what was happening to the characters. We cared about the good guys and hated the bad guys. This Means War has nothing more than cookie cut-out characters that serve a dimwitted plot. Like I said, there are a couple of chuckles, the cast does the best they can and like I said before, I really did want to like this film. No matter how hard I tried, it was just a silly and hackneyed film from start to finish all dressed up with no where to go. 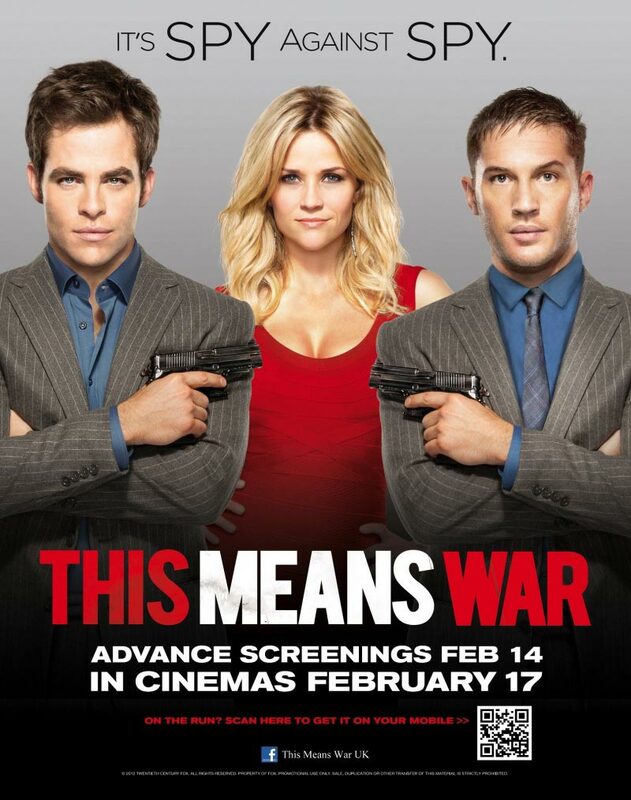 This Means War-*3/4 out of 4. Just a note, there are 2 versions of This Means War. There is a 95 minute version which is PG-13 and an unrated 104 minute version. I watched the extended cut but I am sure either version will bore you to tears only the 95 minute version will shorten your torture session. So if you see an extended cut and think, "Wow, maybe this is better than the shorter, rated version, save your time and money. It will not matter.